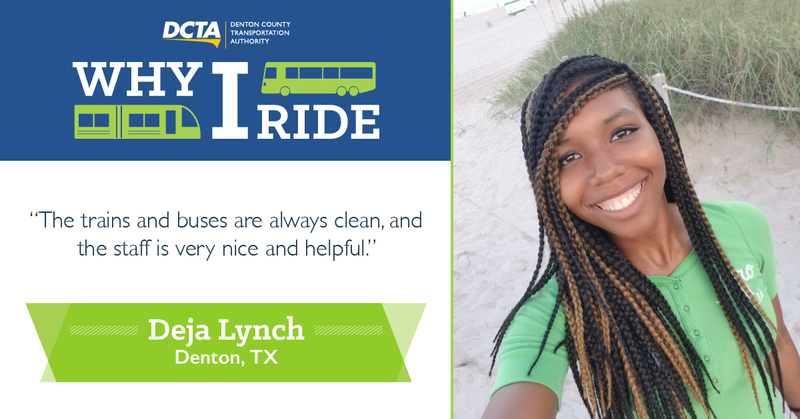 Denton resident Deja Lynch spends most of her days working toward her dream of being a professional dancer, but she never misses an opportunity to explore Denton County thanks to DCTA! Even though we can get you to numerous locations in Denton, Lewisville and Highland Village; our services also provide as a way to unwind and relax between classes, jobs and errands. Here are just a few reasons why Deja uses DCTA to get to where she needs to go. Q: What are some of your favorite things to do while riding DCTA? A: Sometimes I go to sleep, work on homework or put on my headphones to listen to music. Q: Do you have any advice to offer about riding DCTA to passengers and non-passengers? A: If you need transportation, you should ride DCTA because it’s a good price. Q: What do you enjoy the most about riding DCTA? A: The A-train and buses are always clean, and the staff is very nice and helpful! Q: Is there anything you’d like to share about yourself? A: My favorite hobbies are playing basketball, volleyball and dancing. After I earn my degree, I would like to be a dancer for any professional company. Thanks for sharing with us, Deja! Make sure to tell us why you #RideDCTA here for a chance to win 10-pack of regional day passes!